L-Ring 8MM Men's Tungsten Wedding Ring Silver Celtic Dragon Inlay Polished Beveled Edge, Size 7-14(10) | What Should I Say? About Tungsten: Tungsten is a very hard and dense metal with hardness between 8.5 and 9.5 on the Mohs hardness scale (Diamonds are a 10 - the highest). Its density, similar to that of gold, allows tungsten to be used in jewelry as an alternative to gold or platinum. Tungsten carbide is about 10 times harder than 18K Gold, four times harder than titanium, twice as hard as steel, The resulting metal can be designed into tungsten carbide wedding band rings that are both visually stunning to please the eye and durable enough to withstand everyday use. About us: All of our Tungsten rings are Cobalt Free and hypoallergenic. Our rings will not cause skin irritations or turn your fingers green. Due to the Hardness of Tungsten, these rings can be laser engraved, but not hand engraved. Warranty: 100% money back within 30 days and Life Time Replacement Service for any product defects. 8mm in width, 2.3-2.5mm in thickness, weight varies from 6-20g according to different size. Packed in giftbox with the dimension of 2.4*2.4*2inch. High tech tungsten rings are scratch and fade resistant, as well as being hypoallergenic. 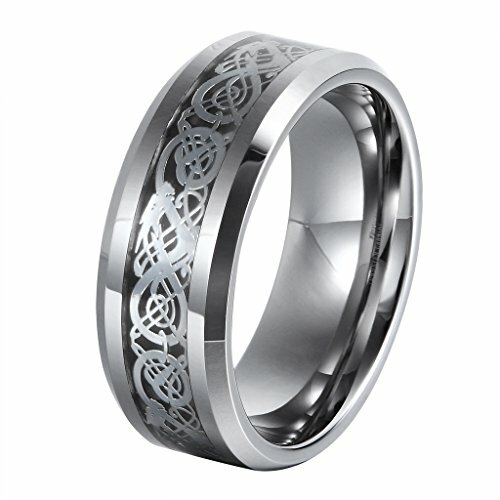 Unique design, comfort fit, perfect wedding band or promise ring for men or women. If you are not sure about your finger size, don't hesitate to contact us, we are here to help! If you have any questions about this product by L-Ring, contact us by completing and submitting the form below. If you are looking for a specif part number, please include it with your message. 14k Yellow Gold Religious Baptism Medal Pendant with 1.2mm Cable Chain Necklace - 22"